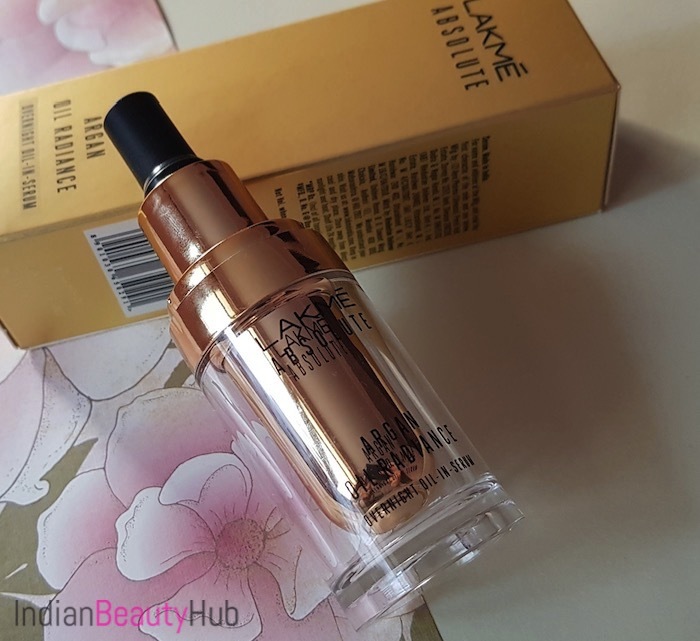 Hello everyone, my today’s review is about the second product from Lakme’s newly launched Argan Oil Radiance products range. 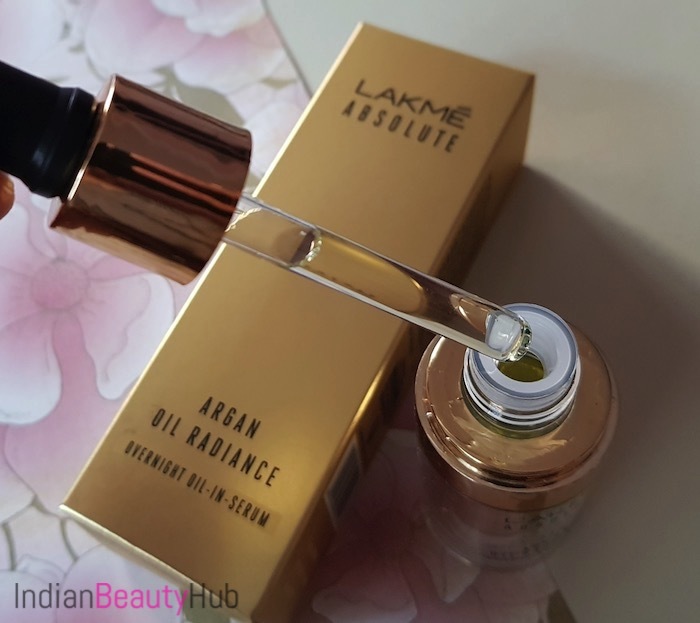 I’ve already reviewed the Argan Oil Radiance Oil-in-Creme and this time I’ll be reviewing Lakme Absolute Argan Oil Radiance Overnight Oil-in-Serum. It claims to be infused with Moroccon Argan oil and combines the power of a serum with the nourishment of oil. The price of the Lakme Argan Oil Radiance serum is Rs.899 for 15ml. You can easily buy Lakme product from local beauty stores, Lakme salons and also online from Nykaa.com, Amazon.in, Flipkart.com, etc. 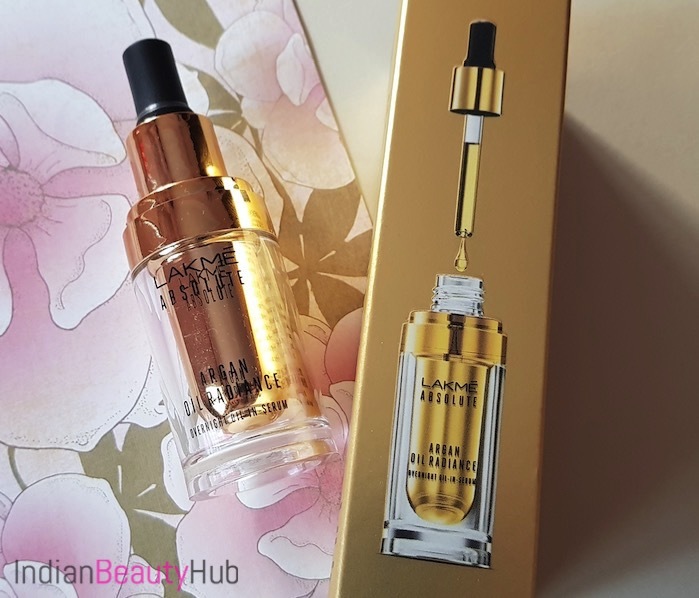 Packaging: The face serum comes in a shiny golden bottle with a dropper. The bottle looks quite luxurious and the important product information like ingredients, expiry date, how to use, benefits, price, etc. is mentioned on the outer carton. 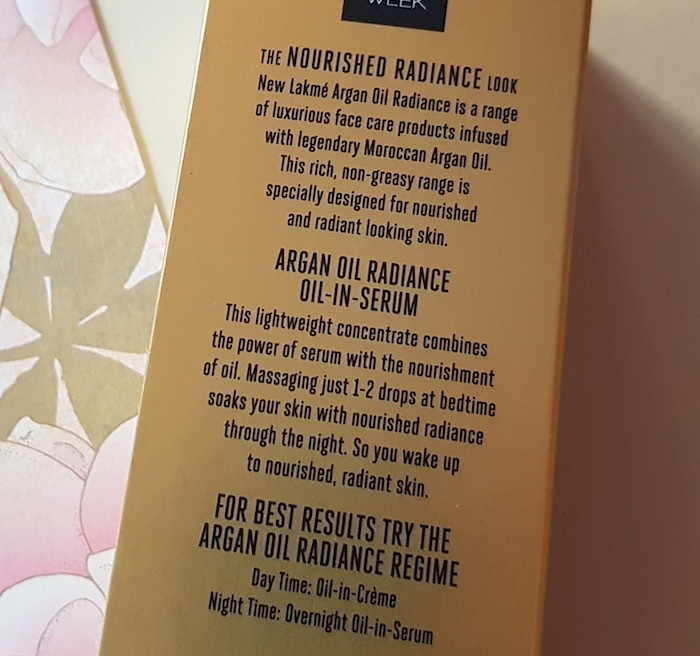 The packaging is very lightweight and hygienic to use however I don’t think it’ll very travel-friendly (because the serum was spilled in the carton when I received it). My Experience: I have a combination skin (oily t-zone, dry cheek area) that is prone to acne, open pores and light blemishes. 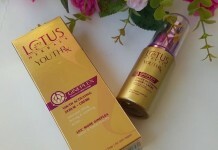 Before buying this product, I was using the Votre face serum that worked really well for skin type. A few weeks back I ran out of the Votre serum and its high price resisted me from buying it again. So I thought why not to give Lakme serum a try as the Argan Oil Radiance sound quite impressive. 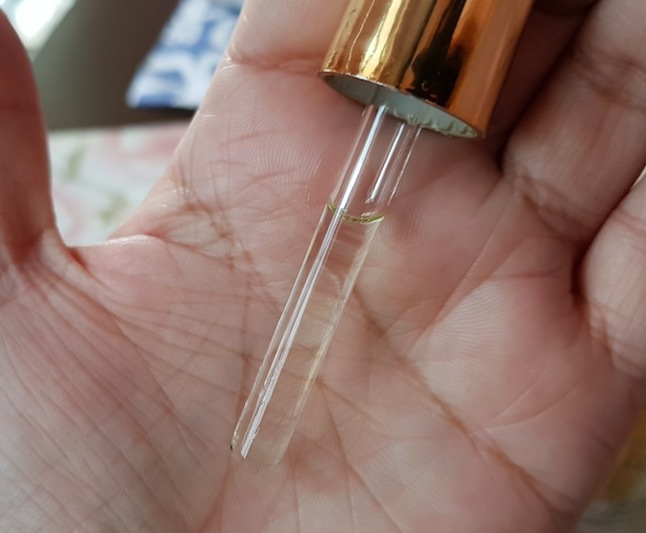 The night serum comes with a slightly thinner consistency and has a pale yellow (almost transparent) color. It has a very mild scent that I found quite pleasant. 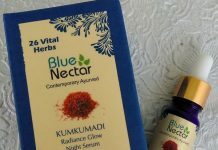 After thoroughly cleansing and toning my face I take 5-6 drops of this serum and massage it nicely on my face and neck. It absorbs completely into the skin leaving my skin soft and hydrated. It doesn’t feels greasy or sticky on the skin. Also, I don’t find the need of applying any moisturizer over it as it alone provides adequate moisture to my combination skin. After using this serum for about a month I have not noticed much improvement in the appearance of my skin. My skin does feel soft, well hydrated and radiant although the after results are not very long lasting. Sometimes I use it as a moisturizer underneath my foundation. Just take 2-3 drops of serum and massage it on the face before applying makeup. Or you can also mix 2-3 drops of it to your foundation for glowing finish especially if you have dry skin. It is infused with the goodness of Moroccan argan oil to provide nourishment to the skin. Lightweight and doesn’t give uncomfortable sticky feeling. Absorbs quickly and leaves the skin soft, moisturized and nourished. Moisturizing enough, no need to follow it with night cream especially if you have combination or oily skin. Whereas people with dry skin can find the need of using some moisturizer after its application. It will easily last for up to 2 months as you will need only 4-5 drops during each use. Didn’t aggregate my acne nor did it cause any allergy or irritation. A little overpriced. I would have liked it more if it came at a price of around Rs.600. It doesn’t give extraordinary results. Packaging is not very travel-friendly. 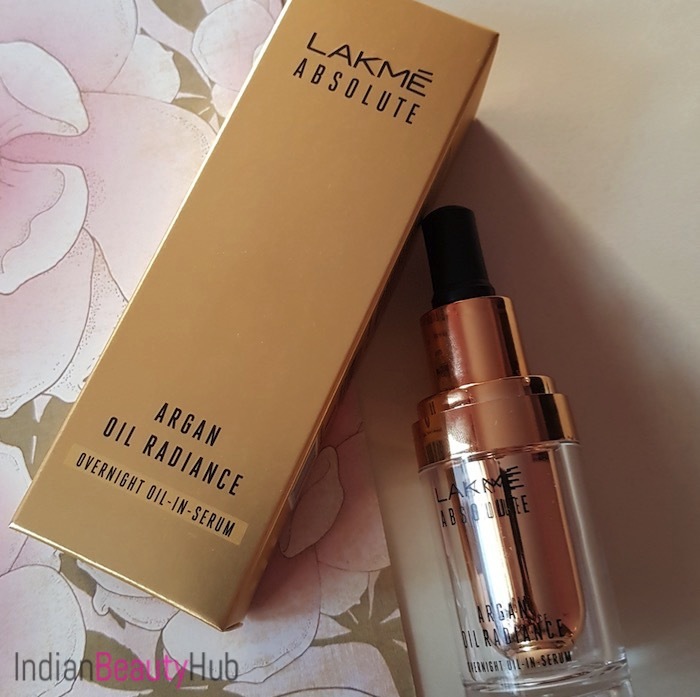 Overall, Lakme Argan Oil Radiance Overnight Oil-in-Serum moisturizes skin nicely and adds healthy glow on the skin. Although the results are not very impressive when compared to its price tag. In my opinion, it is not a must buy, however if you like trying out new products and won't mind paying its price then you can check it out. I want to know the age description..I’m around 18..What will happen if I put this product..Do you recommend it? My skin is also same as yours, so how to apply then???? My skin is also same as yours, so what to apply then??? ?